PLANS to upgrade waste management and recycling facilities in Uralla received a boost today with Northern Tablelands MP Adam Marshall announcing an $83,200 grant for Uralla Shire Council from the NSW Government’s Waste Less Recycle More initiative (WLRM). Mr Marshall said the project being undertaken by council would see an upgrade of the Uralla waste landfill site to decrease the risk of fire, groundwater and air pollution and amenity impacts. “Council will be working on the fencing at the site to improve security and will also install some further signage to assist the public in making choices to correctly dispose of their waste. “The landfill currently services a population of 6,064, accepts 5,000 tonnes of waste annually and has an estimated life expectancy of another 30 years so it’s a very important project for council and I was more than happy to support the request for funding. “I am confident that the funding will also help realise Uralla Shire Council’s goals to address identified issues and manage current liabilities posed by its landfill activities. Uralla Shire Mayor Mick Pearce thanked Mr Marshall for his support and said council was very keen to get the project underway. “I am over the moon with the news,” Cr Pearce said. “We’ll now be able to get going with these important upgrades. Mr Marshall said the government’s WLRM program was a $465.7 million five-year initiative that aimed to transform waste and recycling in NSW. 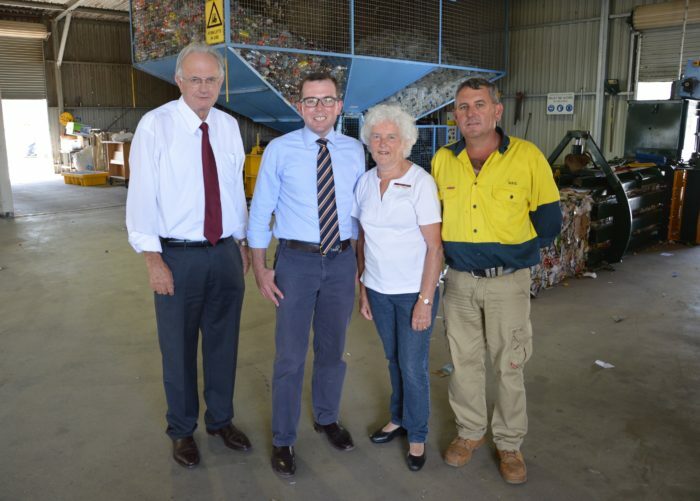 “The program includes funding for business recycling, support for local councils, new waste infrastructure, managing problem waste and programs to tackle illegal dumping and reduce litter,” Mr Marshall said.